No sooner has New Orleans recovered from the revelry of Mardi Gras than it starts all ove3r again. 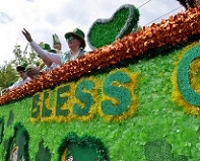 St Patrick's Day is the perfect reason for another round of drinks, parades and parties which cascade through the downtown area, centred on famous Bourbon Street. Traditionally, it's a day for the locals to gather on the streets and pavements with picnic baskets and umbrellas. Groups dance down the street in green costumes, dispensing flowers, beads, and kisses to the spectators. Live bands trundle by on the backs of floats and trucks, providing a festive soundtrack to the celebrations. Meanwhile, onlookers call out to the floats to throw something at them, with the most popular items usually being cabbages, carrots, onions, and the odd potato.